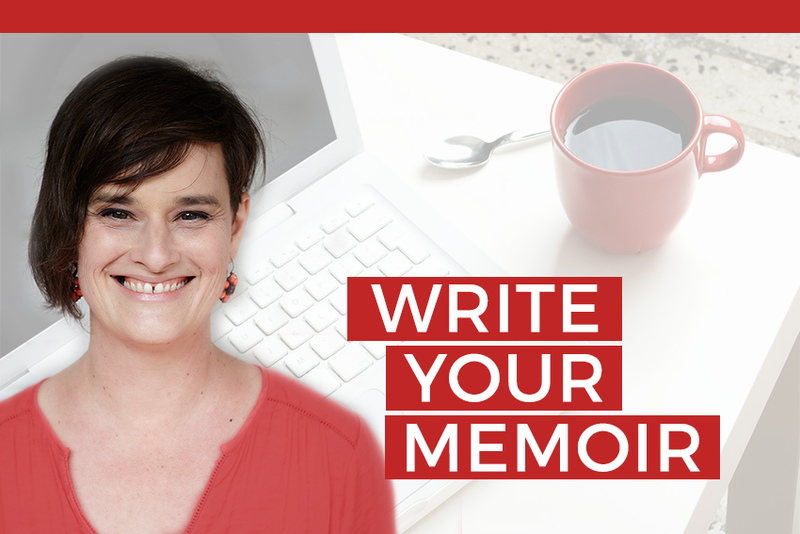 You’re one step closer to fulfilling your dream of writing your memoir. You’re probably wondering if this course is right for you, and I totally get it. But there’s one priority we usually don’t give much time: tackling your dreams. Which in your case (I'm guessing because you're here, reading this) means writing that memoir. Maybe there’s a voice in your head telling you it’s not worth it. There are so many more worthwhile things to do with your time, right? Telling your story is a cathartic experience. It changes things in your heart. Basically, writing your memoir has an effect on you that you can’t understand, and you can’t quantify until you’ve done it. It’s more than just putting words on paper. And it's almost hard to explain how it works. In the thinking, and the writing, and the emotional work, you’re able to put things behind you. You’re able to make peace with yourself in ways that you can’t, any other way. I’ve seen people write their stories and grow in confidence and purpose. They’re able to move forward and break new ground. After the diagnosis of my son with a chronic condition that brought trauma to our family life for over five years, I felt like I was swirling. Things had improved, but I was still stuck in what I’d lived through. I decided that writing my story was something I needed to do – for myself, and my own peace of mind. And it was a catharsis. Where there was mostly grief and crisis, now there was mostly peace and acceptance. Not everyone has a story of trauma and grief to tell. But if you’re here, I can guarantee you’ve got some kind of story itching in your heart, waiting to get out. Because writing a memoir is more than just sitting down with a pen and a notebook and hoping for the best. Even if you’re a reasonable writer and prolific reader, there are still things you won’t know when it comes to actually getting together a memoir that other people are going to want to read. With the help of someone who knows. It’s amazing how not knowing where – or how - to start can paralyze us. I’ve put things off for weeks, months and even decades because I haven’t known where to begin. It’s all been too difficult. But it doesn’t have to be like that for you. I’m here to hold your hand. I’m here to lead you through the process, step by step. I’m here to break it down for you. Writing your memoir is possible. More than that, writing your memoir is something you can do - when you’ve got the tools and the encouragement, and the support. Sometimes I get requests from people who want to tell their stories, but they don’t feel able to do it themselves. “Can you ghostwrite it for me?” they ask. I say yes, but it makes me sad. Because I firmly believe that you are the very best person to tell your own story. It’s you, on the page. And if you do the telling, you get the emotional and personal rewards that come from being part of the process. That’s why I’ve put this course together: to show you exactly how to start, how to keep going, and how to end. You can write your memoir. And you can write a memoir that other people are going to want to read. Because that’s the other reason we write, isn’t it? For other people. When I wrote my memoir about the difficult years after my son’s diagnosis, more than anything, I wanted to let other parents know that they weren’t alone. If someone was going through the same thing, I wanted to bring hope – or, at least, understanding, and solidarity. We share our stories for that wonderful human warmth of connection. Our stories help us relate. They inspire us. They take us to new heights, and new depths, and new levels of courage. If you want to tell your story to encourage other people, you can do it. That's what this course is for. I’m not here to just help you get any old words on a page and be content with that. I’m here to help you create something that works. I’m here to help you tell a story that sings. We're the right people to help you. Let me introduce myself. I'm Cecily Paterson, author, editor and writing coach. My memoir, Love Tears & Autism, won third place in the ACBOY Awards in 2012, and I've edited and coached numerous other writers through the process of writing their memoirs. I work with my amazing colleague, Selena Hanet-Hutchins, an editor with years of experience with fiction, non-fiction and memoir. Together we created and delivered our first 'Write Your Memoir' course back in 2015. Even though sitting in a room with people face to face was an amazing experience, we've brought the course online now, mostly so we can reach more people. We love writers. We love stories. We love to help people write their own stories to share with the world. And we can't wait to help you bring your dream to fruition. The Write Your Memoir course comes in two levels. One of the most common dilemmas for writers starting out is what to include in their story, and how to structure it. In three modules, which include short, easy-to-watch videos, worksheets and downloads (and a few bonuses), you'll learn the step by step approach to creating the perfect plan and a structure for your memoir. You'll finish this level with three possible structures you could use, and a detailed chapter plan. After you've completed Level 1, move up to Level 2 where you'll find five 'Write Your Memoir' modules, consisting of videos, worksheets and downloads. You'll learn how to keep tension in your writing, how to write a scene that works, tricks and tips for dialogue, and easy ways to fix common problems. Plus there are more bonuses, including a resources list for how to publish. The course is excellent. Warm, friendly, to the point. My plan is now much clearer, more confident. The course helped break a large rather scary writing project down into understandable and manageable tasks. I now have an outline for a memoir so that I can move on to actually writing down my experiences. Want to break it down a little more? Is your Story part of a Broader Story? Is your Mother Going to Sue you? - Lifetime access to the course modules. -A bonus that includes resources, tips and ideas on what comes next with publishing. ...to be part of the exclusive Red Lounge for Writers Memoir Group on Facebook. We talk writing, structure, memoirs. We ask questions, share ideas, and we have each other's backs. Course instructors Cecily and Selena will drop in and out of the group. There will be semi-regular live Q&A sessions as well where you get to ask your burning questions. If within two weeks of receiving your last lesson in the last module, you really think this course just isn't for you, or you're not any better equipped to write your memoir, we'll refund the money you paid. fulfil your dream and complete your manuscript. I know now what I need to do to produce my first draft. Now I will start putting together the pieces I've written into the timeline and then start writing the bits I need to elaborate on. I liked it. It was really helpful to have very directed exercises. I especially liked having three options for getting the information - videos, audio and transcript. I'm feeling way more positive and excited than before. This was just what I needed. I've been meaning to write more for my memoir for years, but felt overwhelmed by it. This is an easy reason to not do things. Yes, life is super busy, what with the job, and the chores, and the driving, and the feeding the cat, and the watching TV, and the being nice to our family. But in the end it can be used as a bit of an excuse, amirite? We all make time to do the things we really want to do. If you really want to write your memoir, and you're not just saying it (because hundreds of thousands of people say it every day, believe me, and I know because I've met a lot of them) you're going to have to carve out the time from your daily life. It's not going to happen that one day you wake up and say, 'Hey, I've suddenly got time to write my memoir.' Nope. You're going to have to find that time. Create it. Jealously guard it with everything you have to get your dream done. Where does your time go? Maybe you're like me and you play a lot of Boggle on your phone? (True confessions...) Look at your life. Are there things you could do more quickly, or not do at all? We're all too busy. But the ones who succeed in following their dreams are the ones who've looked for, and found the time, and used it well. Honestly, hardly anyone does. Why would they? It's not as if 'writing your memoir' is something you learn at school. But that's why this course exists. That's why we have a whole Level devoted to planning and structuring your story. That's why our modules are immensely practical, with writing exercises, and worksheets and video lessons that give you the exact steps you need so that you can get started. See above. And think about JK Rowling, who wrote her best selling first novel in a coffee shop while her baby slept in the pram. Yep. Another common dilemma for first time writers. But fear not! We've got that sorted for you. We have very clear directions and guidance on what to put in. We help you sort out what's important and what's not. "I'm worried that my mother will sue me"
Don't laugh. It's a real concern for a lot of people. And even if she doesn't sue you, will she look disapprovingly at you for the rest of your life, or refuse to take your calls? Maybe, or maybe not. It's true, sometimes your story is too difficult, or will cause too many ructions if you share it with anyone else. But sometimes those stories are the ones you should tell anyway. Even if it's just for yourself, to give yourself some closure and peace. Anyway, we have some practical tips on how to manage ruffled feelings and potential minefields in our bonus modules. "I'm scared. What if no one wants to read it?" I think the relevant point here is that fear is real. Fear of putting yourself out there. Fear of re-discovering something you might have wanted to leave dormant. Fear of embarking on a big project, with no guarantee as to if you'll succeed. 'What if no one wants to read it' isn't the issue. The issue is: are you going to be beholden to your fear for the rest of your life? Fear can imprison us and keep us small and silent. It's when we choose to stand up to our fears and do the thing we want to do anyway - that's when we find out who we are and what we're really made of. Anyway, fears seem to magically subside when we have support around us. And this course is built to be supportive and respectful. You'll find the instructor is a kind hand-holder, and the Facebook group is supportive and smart. Put 'I'm scared' in the waste-basket. It's not needed as you embark on your writing journey. "It's an emotional story. I'm not sure I can face those feelings." I'm well acquainted with emotional stories. They do bring up stuff that sometimes we wish we could bury away forever. When you write, you feel. You can't help it. But let me say this: all the evidence, and all the experts say that feeling that hard stuff, and revisiting it, and writing about it, in a supportive environment, is good for us. Yes, it might be hard to feel sad or depressed, or horrified, or abandoned all over again, but in doing it, especially when you have support, you give yourself power to move forward in ways you wouldn't otherwise. At the Red Lounge for Writers, we're not naïve enough to think that writing your story is all fun and games and easy emotions. We know the profound effect writing can have on your psyche. But we're here to help you take care of yourself as you do the work, and make your mark. Like everything, this course isn't for everyone. If you've only just emerged out of the events you want to write about, you might want to take some 'settling' time before you embark on getting it down on paper. Take some time to process it and really think about it, so you have a good grip on what you're writing. And then come back next year and do this course.. If you know 'it's time' to write, if you've had a burning passion or an itch you just can't get rid of, to put your story into a book, you are the person for this course. If you're realistic about the task ahead, and you know it'll probably be bigger (and a little bit harder) than you expect, but you're willing to go ahead anyway, you're the person for this course. If you love to learn, and you want support in your learning, you're the person for this course. Obviously, an excellent cup of coffee every time you sit down to write. Or beverage of your choice - mine is a good hot chocolate, or decaf tea. I also recommend you go purchase a brand new, beautiful cup to drink from, to be used only when you write. A passion and a desire to tell your story. Access to a computer and reasonably functional internet. Proficiency in English (for the lessons) and your language of choice (for the writing). Also, the ability to cope with an Australian accent. Yes, we're Aussies. No, we're not too broad. The knowledge that writing a memoir is a big project, and can sometimes be a challenging one. I'm not saying it's too big or too hard - not at all. But you do need more than just fly-by-night dedication to this one. A Facebook account (this isn't necessary, but it is helpful if you want to join the discussion group). It was really helpful to have very directed exercises and helped a sort of amorphous blobby memoir take a clearer shape in my mind (and on paper), which will help as I continue writing. You’re going to be surprised. Our Write Your Memoir course is ‘Pay what you can’. “Won’t you get ripped off?” I hear you ask. We’re big believers in the principle: what you sow, you reap. What you put into the world, you get back. Sure, we’re taking a risk: maybe people will rip us off. But from what we know of writers — people like you — you’re a good bunch. You’ll pay what you can afford, and then one day, you’ll ‘pay it forward’, and share generously with those around you. The lessons are online. Generally they consist of a short, easy-to-watch video explaining the topic and the practical work, downloads that relate to the content, worksheets and questions for you to fill in (online, using your keyboard, or on paper if you prefer). Once you sign up and the course begins, lessons will be opened up to you on a schedule that we've designed. This is called 'dripping the content' and the reason we choose to do it this way is this: we don't want you to open the course and see EVERYTHING there all waiting and looking terrifying, and have you get overwhelmed and quit. Of course we think it's better if you can keep up with the lessons, but we quite understand that life is life, and things come up. Also, we all work at a different pace. What's slow for you might be zooming for me. Basically, though, don't worry. You have life time access to the material, and if you need to keep on at your own pace, that's just fine. What if my circumstances change and I don't have the time? Again, we get it. Life is life, and things do change. But see above: you have life time access to the lessons and the material, and you can come back to it at any time. How much time do I need to get through each module? Most of the modules have a few lessons in them. It would be best to put aside a full hour for each lesson, to watch the video, do the thinking, and then some writing, all in one hit. Of course, if you can't find a complete hour on that day, you could watch or listen to the video in 15 minutes, use another 15 minutes to think about your responses, and write for 30 minutes at some other time. What if I don't think I can do the work once I've done some of the lessons? First, don't panic. We've set up the course to be step by step. So by the time you've completed Level 1, you should have a good, useable structure and plan for your memoir. From there, we'll take you through the skills you'll need to write it. However, if you get through all the videos and show that you've at least made an attempt at the practical work and the writing, and you still feel you can't do it at all, we'll refund your money if you apply for it within two weeks of the last lesson being released. How long is this actually going to take? The course? If you get through it at the rate the lessons are released, it'll take 12 weeks. If you take longer to do the practical work and watch the videos, the ball's in your court. As for how long you'll take to write your memoir... that entirely depends on you. It might be a project of weeks, if you're fast, and energetic and dedicated. It might be months, if you're a normal-ish person. It might be years, if you find it hard to get moving. I'm tech-challenged. Is this going to be too hard for me? We're all a little tech-challenged, let's be honest. But as to it being too hard from a tech point of view? I really hope not. If you can use a computer to a basic sort of level (click here, scroll there, change tabs, login in that box - basically, like my Nan) you should be okay. And you can always send me an email if you're having trouble with it. Eeek. I know the cost is ‘pay what you can afford’, but I still don’t have a lot of money to pay for it. I would say this: what's your dream worth to you? We're here to teach you exactly what to do to fulfil your dream, and how to do it, and we'll hold your (virtual) hand all the way. You could go get some 'Write your Memoir' books out of the library, and figure things out by yourself without paying any money, but be realistic. Are you actually going to write that memoir on your own? Or will it end up as one of those things you always wanted to do, but never got around to? We find that if we pay out some money for something, we value it more, and we take action more readily. There is a cost, yes. But it's also an investment. In yourself and your dreams. Are you ready to take action?